Launch. It’s the part of spaceflight that is always the most fraught with peril, as your precious and delicate scientific package is encapsulated on top of tons of explosives, the fuze is lit, and the whole package hurls spaceward. As noted by Bob King earlier last week on Universe Today, the European Space Agency’s ExoMars Trace Gas Orbiter underwent just such an ordeal on March 14th, as it broke the surly bonds atop a Russian Proton rocket from the Baikonur Cosmodrome, and headed towards the Red Planet with the Schiaparelli Lander affixed snug to its side. The spacecraft may have very nearly suffered a disaster that would’ve left it literally dead in space. Don’t worry; the ExoMars Trace Gas Orbiter is OK and safely in a heliocentric orbit now, en route for an orbital insertion around the Red Planet on October 19th, 2016. But our robotic ambassadors haven’t always been so lucky. Launching for Mars is a complex odyssey. Unlike U.S. Mars missions such as MAVEN and Curiosity, which typically launch atop an Atlas V rocket and head directly into solar orbit after launch, Russian Proton rocket launches initially enter a looping elliptical orbit around the Earth, and require a series of successive engine burns to raise the payload’s orbit for a final injection headed to Mars. All was well as the upper stages did their job, four burns were performed, and the ExoMars Trace Gas Orbiter phoned home indicating it was in good health afterwards. It’s what happened next that gave planners a start, and is still the source of a minor controversy. While Russian sources tracked the Briz-M upper stage and say it worked as planned, observatories based in the southern hemisphere imaged the departure of ExoMars noted about half a dozen fragments following it. Having done its job, the Briz-M stage was to execute a maneuver after separation, placing it into a ‘graveyard’ solar orbit. Not only would this clear ExoMars on its trajectory, but the Red Planet itself. Anatoly Zak notes in a recent article for Popular Mechanics online that the Briz-M upper stage isn’t subjected to strict sterilization measures, though its unclear if it too will reach Mars. Solar orbit is littered with discarded boosters and spacecraft, going all the way back to the first mission to fly past the Moon and image the lunar farside, the Soviet Union’s Luna 3 in 1959. Some of these even come back on occasion to revisit the Earth as temporary moonlets, such as the Apollo 12 booster in 2002 and the Chang’e-2 booster in 2013. And there is nothing more that the fabled ‘Galactic Ghoul’ loves than tasty Mars-bound spacecraft. Though the ExoMars Trace Gas Orbiter is in its expected trajectory to Mars as planned, it seems that the the Briz-M upper stage may have exploded seconds after spacecraft separation. The incident is eerily similar to the fate that befell the Phobos-Grunt sample return mission. Also launched from Baikonur, the spacecraft was stranded in Earth orbit after its Fregat upper stage failed to do its job. Phobos-Grunt reentered on January 15th, 2012 just over two months after launch, taking its container of Planetary Society-funded tardigrades scheduled to make the round trip to Mars permanently to the bottom of the Pacific Ocean instead. The Mars 96 mission also failed to leave Earth orbit, and reentered over South America on November 16th, 1996 with a radioactive payload meant for power surface penetrators bound for the Red Planet. The Russians haven’t had good luck with Mars landers, though they fared better landing on Venus with their Venera program… and had at least one spare Venusian Death Probe crash on Earth and fight the Six Million Dollar Man back in the 1970’s TV show, to boot. The U.S. has actually had pretty good luck on Mars, having only lost the Mars Polar Lander for seven successful landing attempts. If successful later this year, Schiaparelli will be a first landing on Mars for any other space agency other than NASA. The first image from the surface of Mars? The only picture returned from Russia’s Mars 3 spacecraft, which fell silent 14 seconds after touchdown. Image credit: The Soviet Academy of Sciences. And you’ll be able to explore Mars for yourself shortly, as opposition season for the Red Planet is right around the corner. Opposition for 2016 occurs on May 22nd, and we’re in for a cycle of favorable oppositions leading up to one in 2018 that’s very nearly as favorable as the historic 2003 opposition. Space is hard, but the ExoMars Trace Gas Orbiter seems to be made of still harder stuff, the likes of which no explosion in space can kill. After the tragic failure of the first Phobos-Grunt mission to even make it out of low-Earth orbit, the Russian space agency (Roscosmos) is hoping to give it another go at Mars’ largest moon with the Phobos-Grunt 2 mission in 2020. This new-and-improved version of the spacecraft will also feature a lander and return stage, and, if successful, may not only end up sending back pieces of Phobos but of Mars as well. The origins of Phobos have long been a topic of planetary science debate. Did it form with Mars as a planet? Is it a wayward asteroid that ventured too closely to Mars? Or is it a chunk of the Red Planet blasted up into orbit from an ancient impact event? Only in-depth examination of its surface material will allow scientists to determine which scenario is most likely (or if the correct answer is really “none of the above”) and Russia’s ambitious Phobos-Grunt mission attempted to become the first ever to not only land on the 16-mile-wide moon but also send samples back to Earth. Unfortunately it wasn’t in the cards. After launching on Nov. 9, 2011, Phobos-Grunt’s upper stage failed to ignite, stranding it in low-Earth orbit. After all attempts to re-establish communication and control of the ill-fated spacecraft failed, Phobos-Grunt crashed back to Earth on Jan. 15, impacting in the southern Pacific off the coast of Chile. But with a decade of development already invested in the mission, Roscosmos is willing to try again. “Ad astra per aspera,” as it’s said, and Phobos-Grunt 2 will attempt to overcome all hardships in 2020 to do what its predecessor couldn’t. Read more: Russia to Try Again for Phobos-Grunt? Orbiting at an altitude of only 5,840 miles (9,400 km) Phobos has been passing through plumes material periodically blown off of Mars by impact events. Its surface soil very likely contains a good amount of Mars itself, scooped up over the millennia. Determining that ratio would then help figure out where Phobos was in Mars orbit millions of years ago, which in turn could point at its origins. In addition, having an actual sample of Phobos (along with stowaway bits of Mars) in hand on Earth, as well as all the data acquired during the mission itself, would give scientists invaluable insight to the moon’s as-yet-unknown internal composition. Source: Brown University news release and RussianSpaceWeb.com. See more images of Phobos here. Roscosmos said today that a computer malfunction caused by cosmic rays was the reason for the failure of the Phobos-Grunt spacecraft. Additionally, ‘counterfeit’ chips in the computer may have played a role, said Federal Space Agency (Roscosmos) head Vladimir Popovkin. The original mission was to do a sample return from Mars’ largest moon, but the spacecraft crashed back to Earth on January 15 after the rocket failed to send it out of Earth orbit shortly after the launch in November. This determination comes from a study done by a commission led by Yuri Koptev, former head of the Russian Space Agency. A Russian scientist was also quoted by RIA Novosti that the outcome of the accident investigation should not be cause for dismissals and resignations as much as a “lesson to developers of new interplanetary spacecraft,” said Alexander Zakharov, scientific secretary of Institute of Space Research, which developed instruments and the scientific program the station. Some officials from Roscosmos had threatened the jobs of those involved with the mission. As far as the counterfeit computer chips, Popovkin said the components were imported. “The cause probably is in this,” he said. Reportedly, NASA and the U.S. Defense Department has also encountered counterfeit products, according to an article in Itar-Tass. Zak said an industry source revealed that the commission studying the failure “concluded that the mission failure was the result of the design error and the lack in the ground testing of BKU,” adding that “its shortcomings had been well documented long before the ill-fated launch.” The BKU was the the main computer and the “brain” of the spacecraft. Additionally, Zak reported that the most probable cause was a “simultaneous robooting of two operational processors in the main computer” and the computers “could crash as a result of errors in their software or as a result of some external reasons, such as electromagnetic incompatibility,” industry sources said. The assertion that “foreign radars” had possibly caused the malfunction was apparently tested by the company that built the Phobos-Grunt probe, NPO Lavochkin, with no problems coming from simulated radar interference. “With all external failure scenarios effectively debunked, the most probable cause of the failure was narrowed down to the lack of integrated testing,” Zak reported. Roscosmos also indicated they may try again to send a sample return mission to Phobos. As to the probability of any pieces of the original Phobos-Grunt spacecraft surviving the fiery re-entry through Earth’s atmosphere, most experts agree that most of the debris ended up in the Pacific Ocean. However, some debris may have fallen onto regions of Chile and possibly Argentina. Russia says “eish odin ras”* for its Mars moon lander mission, according to Roscomos chief Vladimir Popovkin. If the European Space Agency does not include Russia in its ExoMars program, a two-mission plan to explore Mars via orbiter and lander and then with twin rovers (slated to launch in 2016 and 2018, respectively), Roscosmos will try for a “take-two” on their failed Phobos-Grunt mission. “We are holding consultations with the ESA about Russia’s participation in the ExoMars project… if no deal is reached, we will repeat the attempt,” said Popovkin on Tuesday. Phobos-Grunt, an ambitious mission to land on the larger of Mars’ two moons, collect samples and return them to Earth, launched successfully on November 9, 2011. It became caught in low-Earth orbit shortly afterwards, its upper-stage engines having failed to ignite. Read more about the tragic end of the Phobos-Grunt mission here. After many attempts to communicate with the stranded spacecraft, Phobos-Grunt re-entered the atmosphere and impacted on January 15. Best estimates place the impact site in the Pacific Ocean off the coast of southern Chile. The failed mission also included a Chinese orbiter and a life experiment from The Planetary Society. Russia is offering ESA the use of a Proton launch vehicle for inclusion into the ExoMars mission, now that the U.S. has canceled its joint participation and Atlas carrier. Roscomos and ESA are scheduled to discuss the potential partnership in February. *Phonetic pronunciation for “one more time.” Thanks to my friend Dima for the Russian lesson! Today (Jan. 15) was the last day of life for Russia’s ambitious Phobos-Grunt mission to Mars after a desperate two month race against time and all out attempts to save the daring spaceship by firing up a malfunctioning thruster essential to putting the stranded probe on a trajectory to the Red Planet, failed. According to the Russian news agency Ria Novosti, the doomed Phobos-Grunt spacecraft apparently plunged into the southern Pacific Ocean today, (Jan. 15) at about 12:45 p.m. EST, 21:45 Moscow time [17:45 GMT] after a fiery re-entry into the Earth’s atmosphere. “Phobos-Grunt fragments have crashed down in the Pacific Ocean,” Russia’s Defense Ministry official Alexei Zolotukhin told RIA Novosti. He added that the fragments fell 1,250 kilometers to the west of the Chilean island of Wellington. Universe Today will monitor the developing situation and update this story as warranted. On Jan. 16 Roscosmos confirmed the demise of Phobos-Grunt at 12:45 p.m. EST in the Pacific Ocean – during its last orbit; #1097. The demise of the Phobos-Grunt spacecraft was expected sometime today, (Jan 15) after a fiery and destructive fall back to Earth, said Roscosmos, the Russian Federal Space Agency, in an official statement released early today before the crash. Since the re-entry was uncontrolled, the exact time and location could not be precisely calculated beforehand. The actual crash time of the 13,500 kg space probe was slightly earlier than predicted. Roscosmos head Vladimir Popovkin had previously stated that perhaps 20 to 30 fragments weighing perhaps 400 pounds (180 kg) might survive and would fall harmlessly to Earth. The spacecraft burst into a large quantity of pieces as it hit the atmosphere, heated up and broke apart. But the actual outcome of any possible fragments is not known at this time. Shortly after launching from the Baikonur Cosmodrome on Nov. 9, 2011, the probe became stuck in low Earth orbit after its MDU upper stage engines repeatedly failed to ignite and send the ship on a bold sample return mission to the tiny Martian Moon Phobos. Phobos-Grunt was loaded with over 11,000 kg of toxic propellants, including dimethylhydrazine and dinitrogen tetroxide, that went unused due to the thruster malfunction and that were expected to be incinerated during the plunge to Earth. Frictional drag forces from the Earth’s atmosphere had gradually lowered the ship’s orbit in the past two months to the point of no return after all attempts to fire the thrusters and raise the orbit utterly failed. The audacious goal of Phobos-Grunt was to carry out history’s first ever landing on Phobos, retrieve 200 grams of soil and bring the treasured samples back to Earth for high powered analysis that could help unlock secrets to the formation of Mars, Phobos and the Solar System. 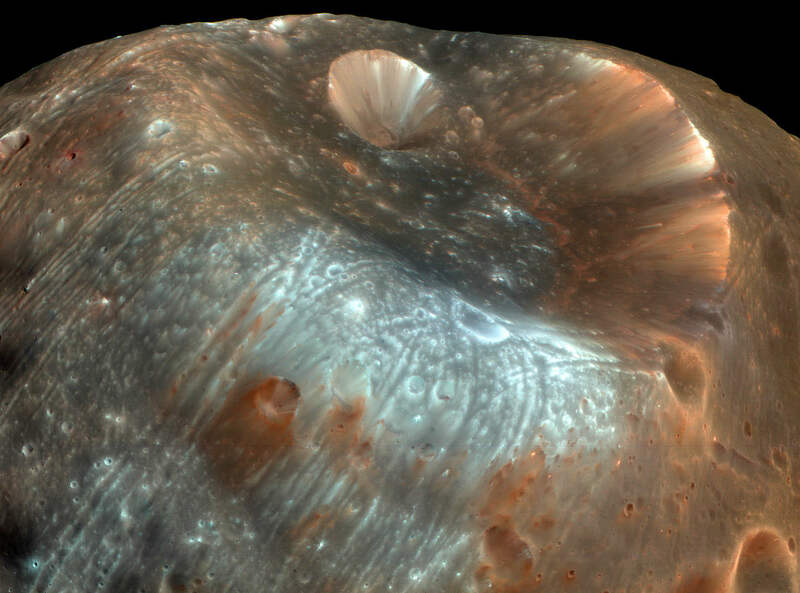 The Holy Grail of planetary science is to retrieve Martian soil samples – and scientists speculated that bits of the Red Planet could be intermixed with the soil of its mini moon Phobos, barely 15 miles in diameter. The science return from Phobos-Grunt would have been first rate and outstanding. It’s a sad end to Russia’s attempts to restart their long dormant interplanetary space science program. The $165 mission was Russia’s first Mars launch in more than 15 years. 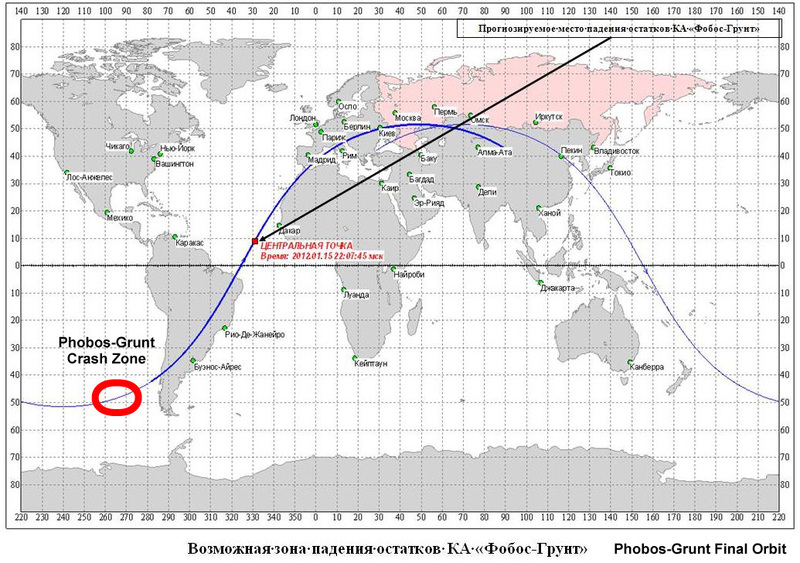 Roscosmos had stated that the Atlantic Ocean – to the west of Africa – was at the center of the predicted crash zone. But nothing was certain and the probe had the possibility to crash sooner, perhaps over the Pacific Ocean or South America or later over Africa, Europe or Russia. Roscosmos had predicted the time of the plunge to Earth to be from 12:50 p.m. EST and 1:34 p.m. EST (1750 to 1834 GMT) or 21:50 to 22: 34 Moscow time on January 15. The last orbit carried the probe over the Pacific Ocean towards South America on a northeasterly heading. Russia enlisted assistance from ESA and the US in a bid to establish contact with the probe to reorient itself and fire up its engines for a belated journey to the Red Planet. Other than extremely brief signals the efforts proved futile and today’s Pacific plunge is the unfortunate end result. Hopefully the Russians will not give up in despair, but rather fix the flaws and launch an exciting new Mars mission. NASA has had better luck with their Mars mission this season. When and where will Russia’s Phobos-Grunt satellite crash back to Earth? It’s too early to tell, but the engineers from Analytical Graphics, Inc. (AGI) have put together an animation which recaps what has happened with the spacecraft so far, and what is expected to occur during the uncontrolled re-entry. According to a news report in RiaNovosti, Russia’s Phobos-Grunt spacecraft will fall January 14th, “somewhere between 30.7 degrees north and 62.3 degrees east,” placing debris near the city of Mirabad, in southwestern Afghanistan. RiaNovosti said this prediction is according to the United States Strategic Command who calculated the craft will reenter Earth’s atmosphere at 2:22 am. If the probe is predicted to fall on land, this raises the possibility of recovering the Planetary Society’s Living Interplanetary Flight Experiment (LIFE), designed to investigate how life forms could spread between neighboring planets. Carrying about 50 kilograms of scientific equipment, the unpiloted Phobos-Grunt probe was launched November 9th on a mission to the larger of Mars two small moons. Although the Zenit 2 rocket that launched the craft functioned flawlessly, sending Grunt into a low Earth orbit, the upper stage booster, known as Fregat, failed to boost the orbit and send it on a trajectory toward Mars. Thought to have reverted to safe mode, Phobos-Grunt has been flying straight and periodically adjusting her orbit using small thruster engines. While this maneuvering has extended the amount of time that the probe could remain in space before reentering Earth’s atmosphere, ground controllers have been struggling to establish a communication link. For a while, space commentators considered the possibility that Grunt might be sent on an alternate mission to Earth’s Moon or an asteroid, if control could be restored after the window for a launch to Mars and Phobos was lost. During the past few weeks, the European Space Agency (ESA) started and ended efforts to communicate with the spacecraft on several occasions, but succeeded only twice. Various scenarios were imagined in which aspects of the probe’s mission could be salvaged, despite the serious malfunction that prevented the craft from leaving Earth orbit. But at this point, the only direction for the spacecraft to go is down. In addition to equipment for making celestial and geophysical measurements and for conduct mineralogical and chemical analysis of the Phobosian regolith (crushed rock and dust), Grunt carries Yinhou-1, a Chinese probe that was to orbit Mars for two years. After releasing Yinhou-1 into Mars orbit and landing on Phobos, Grunt would have launched a return capsule, carrying a 200 gram sample of regolith back to Earth. Also traveling within the return capsule is the Planetary Society’s Living Interplanetary Flight Experiment (LIFE). 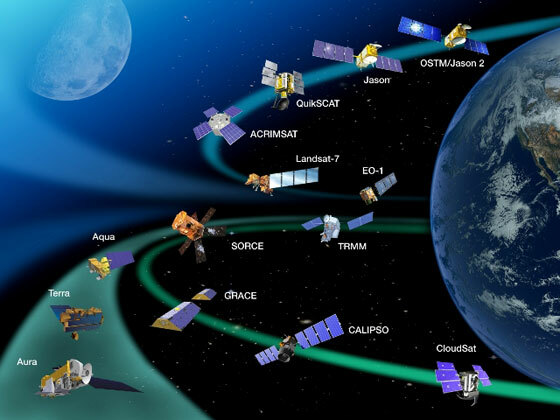 Specifically, LIFE is designed to study the effects of the interplanetary environment on various organisms during a long duration flight in space beyond the Van Allen Radiation Belts, which protect organisms in low Earth orbit from some of the most powerful components of space radiation. Although the spacecraft has not traveled outside of the belts, the organisms contained within the LIFE biomodule will have been in space for more than two months when the probe reenters the atmosphere. The many tons of toxic fuel are expected to explode high in the atmosphere. However, since the return capsule is designed to survive the heat of reentry and make a survivable trajectory to the ground, it is quite possible that it will reach Afghanistan in one piece. Because the LIFE biomodule is designed to withstand an impact force of 4,000 Gs, it is possible that the experiment can be recovered and the biological samples studied. To be sure, the possibility of recovering an unharmed returned capsule and LIFE depends on the willingness of the inhabitants around the landing site to allow the Russian Space Agency to pick it up. Given the proximity of the predicted landing area to a war zone and the fact that the Taliban are not known for being enthusiastic about space exploration and astrobiology, it is also possible that a landing on land could turn out no better than a landing over the deepest part of the ocean.